I have been away from this journal for a long time - though still very much at the school - and now I'm back. I would like to thank you who have been reading these words here, and for the many kind words I have received in response. It's lovely to hear you have been following the school and connecting with the thoughts and feelings behind our work. I will be renewing my efforts to share here each week or two, and hope you will continue on with me. Past entries may be found in the archive, from our Notebooks page. So much has happened in this last year, full of joy and struggle. I completed my Boxwood cabinet in the fall and presented it to the class at our final Elephants in Robert's shop, along with two exceptional Upward Spiral students and their cabinets. You will soon be able to view the studio photography for these pieces and other recent work, on Our Work page and my faculty page. In my presentation to the class I found it difficult to talk about my cabinet as a whole, or some finished object... The work spanned a long time, so it is hard to pinpoint specific moments of discovery, or triumph, or despair, though I know there were many. The emotional memory has faded somewhat along the way. But here at the end of it, what has come through is this knowing, that I was working how I wanted to. For that I look back on my work fondly, and can say that I am very proud of the work I have done. Things happen, but they can be fixed. I so enjoy using this small sweet knife, with its handle of Vera, made by my dear friend Brad. I received it just in time for carving latches and consoles. Thanks, Brad! For these fittings I kept to Boxwood as well, but selected from the darker section of the plank - I wanted the interior to stay calm. The back panel is of Yellow Cedar, out of a piece I acquired on that same wood run where I took home the spalted Chestnut that started this whole thing. The colour is a beautiful match for the Boxwood, as is the tight grain and silky soft texture. As some of you at the school have noticed, I have quite a few planks of Yellow Cedar stockpiled behind my bench - it has become one of my favourite woods. The fitting of the doors was perhaps the most challenging part of the process, but I sure learned a lot here. There was a bit of wind in both doors that I hadn't accounted for when mortising for my hinges, so it was tricky to get them to meet flush in the middle. I will know better next time. After attaching the glass and panels for good, my last step was making and attaching the pulls. I took my sweet time carving these, out of a small piece of Olive wood from JK, given by Robert. The smell of Olive is one of the best in my opinion. It carves beautifully under a sharp knife. The tiny wedges I cut out of some darker Afromosia. Gluing these up next to finished surfaces was nerve-wracking, but successful, I flushed off the backs and then hung the doors for the final time. 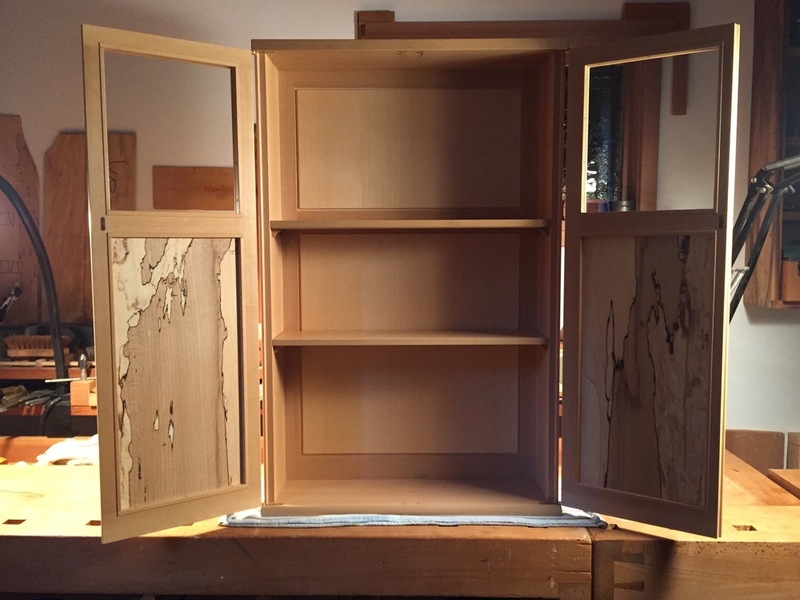 In the midst of work on this cabinet, I took the summer away from it to take the Impractical Studies program again. Here is my Wabi Sabi cabinet from this summer, which I am very proud to have hanging on the wall here, as a reference for our students (and my personal enjoyment.) I love this little cabinet dearly, so different was my approach than with my other cabinet. I had a blast making it! Fun as it was, I had a more serious goal in mind as well. I went through each exercise in the program in preparation for the coming sessions, where I would be taking on a greater teaching role at the school, and Robert would be spending more time in his own shop. Over the last year Robert and I have been exploring different arrangements that this role would take, and in the fall we finally settled on the current schedule of me teaching two days a week at the school. I want to say a word of thanks to our students over the last year for your patience and encouragement as we worked through this transition. Now two weeks into the winter session at the school, I think we have established a good rhythm and balance, and I am enjoying each day with a great group of eager new students. We'll be continuing to dial things in as we go, and welcome your feedback and ideas on how we can improve. A final word to you my friends who have come and stayed and left and returned - you have been the best part of my journey here, and many blessings on your journeys ahead.